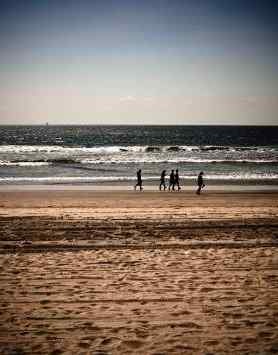 Visit spectacular Coronado Beach in San Diego, California. Coronado City Beach is rated one of the top ten beaches in the world, and is frequently rated the best beach in California. You won't be disappointed with a trip to this beach, and Coronado Island is fun too. Spend a day relaxing at the beach, exploring the town by foot or bicycle. It's hard not to fall in love with Coronado. The beautiful wide beach is set in the upscale community of Coronado, full of impeccably maintained parks and mansions. If you are looking for the best beaches of San Diego, or a picture perfect vacation destination, Coronado Beach San Diego must be on your list. From Point Loma you can see a great view of Coronado, downtown San Diego and the San Diego Bay. The Coronado-San Diego bridge was designed to offer stunning views, so be sure to enjoy the view as you go across the bridge. Parking: Free public parking lot at end of Avendia Lunar and Avenida de las Arenas, and free street parking available. Getting There: Short walk to the beach from parking areas. Things to Do: Walking, jogging, roller blading, sunbathing, swimming, bodyboarding, surfing, sailing, volleyball, kayaking, beach fires in firepits, ferry ride to San Diego. 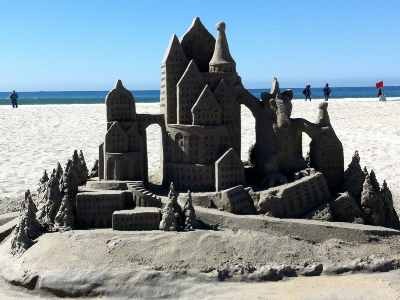 Things to See: Young people at the beach, sunset over the Pacific Ocean, Hotel del Coronado, romantic couples on their honeymoon, beach weddings, downtown Coronado, sandcastle art from the Sandcastle Man. Facilities: Restrooms (behind lifeguard station at Isabella Ave.), showers, changing rooms, trash cans, boardwalk along the beach. Services: Many restaurants, bars, surf shops, rental shops and hotels along the beach. Most restaurants are located along neaby Orange Ave. between 10th St. and Silver Strand Blvd. Lifeguard: Lifeguards during summer. Call (619) 522-7346 for information. Dogs: No dogs allowed except at northern end of Coronado beach near the Naval Air Station, where there is a dog beach. Things NOT to Do: No alcohol, no glass containers, no littering, no disturbing noise, no overnight sleeping, no camping. Disability Access: Good disabled parking and facilities near Isabella Ave. Hazards: Sand can be hot - be sure to bring beach shoes. Rip currents, strong surf in places - check with lifeguards for safest places to swim. The world famous Hotel del Coronado, or the Del as it is called, sits majestically on the Coronado City Beach, which stretches from the Del along Ocean Blvd. to the boundary of the naval air station. This is a must see for your San Diego vacation. Try the Sunday brunch. The Victorian hotel from yesteryear opened in 1888, and features spectacular architecture, lush grounds, fine dining and a History Gallery. An hour long walking tour led by the Coronado Historical Association is worthwhile. If you are looking to stay at a Coronado beach resort hotel in a romantic picturesque setting, you can’t go wrong with Hotel del Coronado. There are rooms in the historical hotel, villas and beach front cottages all on the beach at Coronado city beach, the best beach in California. The resort offers a heated outdoor swimming pool, high-end spa, fine dining and shopping, and is the most popular location for beach weddings in San Diego. From $249 per night. Other Coronado Resorts - Another nice Coronado hotel is the Coronado Beach Resort hotel, located near the Del on Orange Ave. From $99 per night. 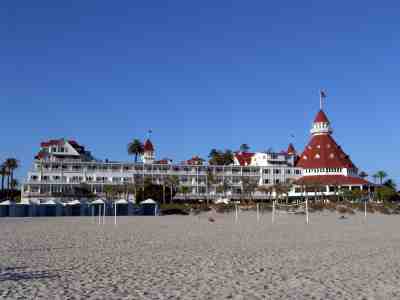 Or check out Loews Coronado Bay Resort (see more information under Coronado Dog Beach). The northern end of Coronado Beach San Diego CA , next to the Naval Air Station, is a San Diego dog beach for unleashed dogs. The beach is wonderful and there is an area to hose your dog off when you are done. Directions to Coronado Dog Beach - From Interstate 5 in San Diego take CA-75 S toward Coronado and go over the Coronado bridge. Continue on Third Ave. to the end and turn left on Alameda Blvd., right on Marina Ave., and turn right on Ocean Blvd, and look for parking at the end of the road. Located on Ocean Blvd. near Sunset Park. Keep you dog on a leash until you arrive at Dog Beach. For a real doggie treat, stay at the Loews Coronado Bay Resort (www.loews.hotels.com) and get “surf & turf” room service for Fido. 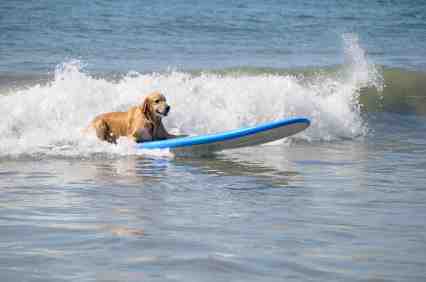 Signup for Su-Ruff Camp dog surfing lesson with instructors from the Coronado Surfing Academy. Maybe this summer your dog can win the Loews Coronado Bay Resort Surf Dog Competition! Looking for a Different Coronado Beach in San Diego? Other Coronado beaches in San Diego, Calif. include Silver Strand State Beach, a popular RV beach campground, Glorietta Bay Park near the Coronado Municipal Pool, Tidelands, with a spectacular view of the Coronado-San Diego Bridge, and The Landing. Coronado Beach Directions - From Interstate 5, take the CA-75 exit towards Coronado and go over the Coronado-San Diego bridge. The bridge will lead you to 3rd Street. Turn Left onto Orange Ave. and bear right on Isabella Ave. End at the intersection of Isabella Ave. and Ocean Blvd. Look for parking anywhere you can find it.